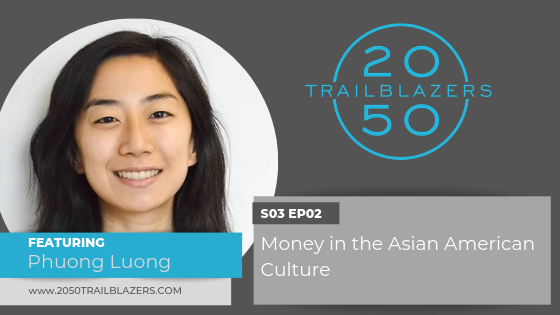 We’re so excited to welcome Phuong Luong back to 2050 TrailBlazers for this episode to talk about the money, culture and the history of Asians in American. This season we’ve been focusing on where money and culture intersect, and how we as business owners, financial planners, and humans can start to be more cognizant and intentional about interacting with one another while knowing and understanding each other’s money backgrounds. In this episode, Phuong is dispelling many stereotypes that Asian Americans face about money and otherwise. We’re talking about the generational stressors of supporting parents and grandparents, systemic racism that has pushed Asian Americans to pursue specific career paths, and how historic oppression and a culture of code switching has pitted different racial stereotypes against each other - to nobody’s benefit. This episode is a must-listen for anyone who is interested in Asian American culture, and how money plays into their cultural background. Phuong does a fantastic job of offering both her personal experiences, getting vulnerable in her conversation, and providing well-researched information about the Asian American culture as a whole. Rianka: 00:00 Phuong, welcome back to 2050 TrailBlazers. Phuong: 00:03 Thanks so much for having me. I'm so excited to be back talking with you, Rianka. Rianka: 00:06 I am so excited too. So if you are a new listener to 2050 TrailBlazers, please make sure you tune into Phuong's first episode with us from season one, episode six where we talked about how to have honest conversations around inclusion when diversity becomes a catch all term. It was a phenomenal, eye opening conversation and it indeed spark conversation. How was it for you Phuong? Phuong: 00:37 It was awesome. You know, and, and the feedback from the episode just made me feel really great. Many people reached out to me, and let me know they appreciated the interview. And I think what was most helpful about it was that it was, we started with the vocabulary and talking about history and I think that was really helpful because most people don't learn that history. And so it's kind of set the foundation for other episodes that you had during that season. Rianka: 01:01 Yes. And I always refer back to your episode as a big a-ha moment for me. It's when I learned code switching. And we talked a lot about history, which we'll dig into today as well. But just about red lining and how that has drastically affected the ability to build wealth in certain communities. And so we are going to jump right back into it. You know, for this season, if this is your first episode that you're listening to this season, we're talking about money and culture and how we can just be better people, better financial advisers when there is a client sitting next to us or across from us, from a different culture. You know, it's, it's really not until we actually have an experience with a client or someone who's different from us that we have an opportunity to learn. And so it's my hope in this season is for us to learn through sharing experiences. Rianka: 02:02 And I am bringing on individuals who represent the beautiful mosaic that is America. So I am so excited again Phuong for you to come back on because, I mean I see you all over the place now and one of the places that I saw you, late last year, so still here recently was at the CFP board diversity summit and it was there where you had an opportunity to do a Ted talk and for those who want to check it out, it was phenomenal. I'll share the link to the video in the show notes and it was, I again, like every time I talk to you Phuong, I have these a-ha moments or, I'm learning something from you. And so I'm very appreciative. One of the things that I learned from you during your, your Ted talk was a little bit about American history in the late century, you know, Chinese were Chinese. It's not Chinese Americans is, it is okay to say Chinese, like Chinese people? Phuong: 03:09 Yeah, Chinese people. They weren't Americans yet. Phuong: 04:28 Exception that it was made for restaurant owners. All right. And so I shared that story to talk about the importance of understanding history and something that has occurred since then is that there we see a lot of Chinese restaurants in America and we think, oh, it's just, it's because people love Chinese food, right? It's Chinese food is delicious. But actually it's because of that institutional racism, that I summarized during the summit. That that was really the only opportunity for Chinese Americans to to be able to make a livelihood in America, in the United States. Rianka: 05:28 1943 to be exact. Phuong: 05:38 for 60 years, right. It, it, that, that act was in place. And so if that act was still in place, I wouldn't be here. My family wouldn't have been here. And I wouldn't be able to start my own financial planning practice. So it's just, it just goes to show that the laws make a difference. And, and you know, thinking about diversity, but also thinking about race and racism and segregation and integration. Now. I think back to why I started learning about the history and why I realize and when I realized it was so important to learn. And it was when, it was actually during my years as a teacher, I started, working as a teacher before I became a financial planner. And I talked about this in my, in the first podcast with you, Rianka. And I went to a conference, it was, the conferences on equal opportunities for, for African American men, in, in public school. And I learned about this word called sankofa. It's an African word from the Akan tribe in Ghana. I don't, not sure if I'm saying I'm Akan right, but it's a k a n, and basically it means that we have to look to the past because if we know our history, we know our power. Phuong: 06:57 Understanding history has been so powerful for me and understanding my own life. And, and, and why we see the diversity issues we see. Why we were seeing the segregation we see. And the lack of diversity in different fields, not just financial planning. Rianka: 08:04 they got to where they are today, if that makes sense. Does that make sense, Phuong? Phuong: 08:09 Yeah, yeah, that definitely makes sense. And not just for clients, but just for colleagues, for anybody that you run across, come across. And what, what's interesting is that even, you know, I, I've, I've read a lot about the history and actually a book I can recommend and one that I read in one weekend and I was kind of a mess after reading it. I only read it maybe two or three years ago. It hit me in a really deep place. The book is called the Making of Asian America. By Erica Lee. The Making of Asian America, a history by Erica Lee. And, I've, I've read a lot of what the history of Asian America, but also of, just just different ways that, economic oppression has occurred in the United States through laws. And just social norms, but not everybody has. And what I'll say is other Asian Americans that I, that I have met more often than not, we don't know our own history. So if you had talked to me five years ago, I wouldn't have known any of those. Phuong: 10:40 exactly. Yes, exactly. And, and it shows up today in different ways in terms of the wealth divides. So we often talk about the wealth divide between white and black and white and Latin x communities. But there, there's less known about Asian American wealth divides because often it's not measured. But some cities have documented this and, for example, in LA it's well known that, well, with, among researchers it's well known, but the general population doesn't know this, but there's a very large wealth divide even within the Asian American community, where newer immigrants and southeast Asians, such as people from Vietnam, Cambodia, Thailand, from Laos, have much less median wealth then other Asian American communities like Japanese, Chinese, and even between white communities and Asian American communities. Even though Asian Americans have a higher median wealth than blacks and Latin x people, our, the Asian communities median wealth is still substantially less than white Americans. Phuong: 11:58 So there's still a divide between white Americans and Asian Americans. But again, it's tricky because this, the wealth numbers are hard to get and often Asian Americans are excluded from surveys and excluded from research. And there is this, you know, and I understand the urgency. I understand the need for, efforts focusing on black and Latin x and I've focused a lot of my own advocacy and my own organizing work in for and with those communities as well. However, when we exclude again and again Asian Americans from the story, we miss such a large part of American history and the reasons for why things are as bad as they are. Rianka: 12:41 Yeah. And I think it's okay. I know many people will probably have an a-ha moment about the Chinese restaurants. I know I was standing on stage because I was up next right after Phuong. And, we tried to not listen to each other's story just so we can have that same, I guess reaction and impact that our stories will have on the audience with each other as well. And it was very raw. It was very raw for me. And I'm happy the camera wasn't on my face because my mouth opened. I was like, what? Wow. As far as laws and so this is what we mean by institutional racism. Like that laws are, were created in the past to hinder the wealth of a particular nationality. And you know, again, it's, it's a ripple effect. It was, you know, 60 years for that. Rianka: 13:42 The red lining, which you can learn more about, in Phuong's previous episode with black Americans and you know, the ripple effect with that and you know, the racial wealth divide that that has created. And it's something that you mentioned in your talk Phuong. And you know, I believe it's important for us to talk about the history of Asian Americans first before we can start talking about like, all right, now if you, if you have Asian American clients, here are some of the things you want to look out for. But, you know, something that you mentioned in your talk, you know, which I think was so profound and just like you said it like it is right you, you said that since the founding of America, race has been used as a tool to determine who has the right to build wealth run for office and start a business and who doesn't. And I think if we can all just agree on that, then we can then move forward and really truly start having some real talk about how do we actually close the wealth gap. Phuong: 14:45 Absolutely. And I think thank you for pointing that quote out. And I should also say that your talk was, was also awesome, Rianka. And so when, when viewers or listeners I should say, watch that talk, Rianka's was right after mine, and Louis Haas is right before mine. And so I think all three are, all three stories are, are excellent to watch them together. You know, I think this is what you had just said about, about, race being a tool. Asian American history has also been used as a tool. And it's important to learn. Yes. Because there it's, so, there's a term that I learned several years ago called the model minority myth, right. And so people often say, and it's so, so the term might be new, but the myth is I don't think it will be new to listeners. So oftentimes there's a stereotype that Asian Americans are very good at school that were obedient, that we are very hard working, that we, are good employees. Rianka: 15:44 that you're good at math and science. Phuong: 15:47 Yeah. Yeah. I talked a little bit about, about that in my talk as well, I referenced that, and how in many ways that helps, but in many ways that also hurts. It doesn't just hurt Asian Americans. That hurts other people of color. Because with that myth, which was created during the civil rights era to put down other people of color, specifically black Americans to say and to point fingers and say, Hey, look, look at those Asian Americans. They're doing so well. Why aren't you doing as well as Asian Americans? Right? When, when, when actually it's, it's the policies that were shifted and changed and also racism and, and, and cultural, you know, understanding and appreciation of Asian Americans. When before that, I mean, we already talked about the Chinese exclusion act. Phuong: 16:34 We didn't really talk about Japanese internment camps, but there was incredible racism against Asian Americans. That was just documened that was documented and in laws, but it was, it was, but it changed, right? It changed to break up solidarity between people of Color. And so, so for example, if we look at today, right? Today, so from research from an organization called Prosperity Now based in DC, Asian Americans suffered the greatest loss of wealth during the great recession, right? In 2008, the greatest loss of any other community. In terms of wealth. Yes. And I didn't know this until actually looking at that report, just preparing for our talk today. I knew it was bad for all people of color, right? But for Asian Americans suffered the greatest loss. And this really highlights the economic vulnerability of the community. Also, when we look at educational attainment, right? So Asian Americans do as a whole earn more than any other racial category in the United States. I'm not sure why that is, but that is the case. But when educational attainment is factored in, Asian Americans still make less than white Americans. All right. So here, here's the statistic. White American men with a bachelor's degree earn about $73,000 a year. Asian American men with the same degree or in about $57,000 per year. Rianka: 17:56 So this is right here firsthand stats of this is how the racial wealth divide happens it starts with our ability to earn income, even with the same level of education. So, wow. So thank you for sharing that. That stat with us. And I would love if you can send me over that link so I can add it to our show notes. So for those who want to get educated around this, you know, it can. So with all this information, Phuong I'm, I'm happy we started with the history because it just like you said, in order for us to move forward, we have to know where we come from or you know, where others have come from in order to support them and help them grow. So this is a part of the culture, right? And so it is a direct correlation and impact to, to money and how we deal with money. Rianka: 18:50 And so Phuong for the listeners out there who, I mean you can't see us, but Phuong is an Asian American. She is Chinese and Vietnamese. And so, you know, just thank you. I know you don't represent the entire population of Asian Americans, specifically Chinese and Vietnamese, but I, but I do just thank you for your vulnerability of just sharing this and, you know, representing for, for your people. Phuong: 19:47 by training financial professionals. And also financial professionals working in nonprofits, working with low income communities as well. And I always start every training, even if it's just about a financial topic, I'd start with, just a quick review of economic history and also racial wealth divide. And I do that because, not to say that that a financial planner or a financial counselor or a financial coach is going to, you know, have a conversation about wealth divides over the last two centuries with their clients. But, but knowing that changes the way you, you do your work, it changes your perception of the client. It changes. And, and it removes as much as possible if, the judgment that you may hold, right, toward yourself or, and, or the client. And so, for example, here's one example. I was working with a client recently and, she's a young woman. Phuong: 20:50 She's a young Asian American woman. She's Chinese and she makes an excellent income. And something that I know, you know, and it's based on the history, but also based on my personal experiences is that oftentimes, so I consider myself first generation because I went to college, my parents did not. And, and also I was born in the United States. My parents immigrated from Vietnam in the early eighties. Right. So I consider myself first generation, that the opportunities that I've had as a first generation Asian American are very different from my parents' experience and the life they experienced as adults being here, being born in another country with very different financial systems, very different educational systems, a completely different language. They came here, they were not fluent in English and they still are not completely fluent. But I grew up as a native in America and you know, my financial situation is very different from theirs. Phuong: 21:48 And so I made sure to ask this, this young woman, when we started talking about her long term goals, well actually I asked her what are your long term goals? And, and she, she didn't really have anything to share cause she was mostly focused on current needs and current questions related to her debt and investing. And she asked me, well, what do typically, what do people typically, answer when you ask them about long term goals? And I said, well, sometimes people say when, what they're thinking about in terms of retirement, when they're thinking of retiring, we can talk about that. We can also talk about, parents if that's something. And then taking care of older parents. That's something that comes up. And she, I saw her perk up, she went, oh yes, I, I help my parents in terms of translating for them and interpreting for them. Phuong: 22:43 And I'm worried about my mom. And after talking a little bit more and asking more about her mom's situation, the, the, the client started crying. And it turned out that she's very worried about her mother, that she, is that there's a lot of stress that, that this client experiences from not being able to live in the same city as her mother of not being there for her for every form, for every account opening, for every letter that might come in that the mom doesn't understand. And the, the client is worried that she's missing things, that she's not helping her mom prepare as best as possible. And it was just amazing for me to, just be there for the client and I had to resist as much as possible not sharing my own story because it's a very similar story for me. And I'm sorry, I'm getting a little emotional. Yeah. So, so just not to make assumptions, you have to assume that just because this young person is doing very well, that, that other generations are doing as well. Rianka: 24:00 You know, I share as oftentimes as I can with clients that it's a privilege to work with them. And I am sure it's a privilege for your client to work with you as well because you have a similar story and it's a similar background. You can not only sympathize but empathize with them as well. And it sounds like first generation immigrants or you know, it's kind of like first, first generation immigrant and also first generation college graduate is the new sandwich generation. You know, we've heard that term for Gen-Xers where the older Gen-Xers they are taking care of their parents, from a financial standpoint or maybe as a caregiver but also raising children as well who may be in grade school or high school. And it sounds like for someone in your client's position or maybe even you, it is the sandwich generation in a sense of being able to support your parents or you know, your client support and their parents from a financial standpoint. But then also almost kind of like a power of attorney. Like, just being there to like, translate for them being there to, to help with healthcare, being there to help with finances. And then also, you know, we're at the age where we're starting families ourselves. And so it's like, how do you balance it all? And so being able to be there to support for that client, I know it's just like amazing for her. Phuong: 25:31 Yeah. And they actually, I think it was like, yes, all that. And I think when I think back to, I think this client when she emailed me before we started working together that, you know, she, that she wanted to meet with someone who might understand her background. Phuong: 25:49 But it still took, took me some probing, some questions, for me to bring it out for her, what she really wanted to talk about. And I think that was, just really important for us to get out in the beginning of the relationship. Some other details actually I do want to share is that her, her, her mother and her father, although they are together, they're separated, for Asian American families that I know divorce is a taboo. And so her parents live separately in different states, but formerly they're still married on paper. So that might add another level of complexity, for a financial planner. And in addition, her mom doesn't speak, does not speak fluent English. And so, so what we did was, and, and I, and I don't speak the her her mother's language. And so what I, what I did was I found a, I went on the cfp.net tool. I think it's, letsmakeaplan.org and I searched and it allows you to actually search for language and zip code. Rianka: 26:49 Wow. I knew about the zip code. I didn't know about language. That's pretty cool. Phuong: 26:53 Yeah. And so I found several, and then I just took a look at what they're offering. I took a look at their, their minimum asset level, and I was able to refer her to two financial planners. And so well hopefully, one of those will be able to serve her mother. Rianka: 27:11 Wow. And this is again a prime example of why America is a mosaic. We're moving away from the homogeneous feel of what America used to be and we're turning into a mosaic with, with different ethnicities and different cultures. And you'll hear me say time and time again, like in order for our profession, our industry to continue to grow and thrive our practitioners have to start looking like the America that we want to serve. And your example, Phuong is a, is an awesome example of why we need more of you in this profession. Thanks. More Phuongs. Rianka: 27:57 So we have cover a lot in a short period of time, which is amazing Phuong cause you know, you and I can talk. So we've covered the history of Asian Americans. Not all, but you know, just a really quick brief history. I encourage everyone to go look at the show notes and take a peek at a Phuong's Ted talk that happened late last year. It was amazing to get the full, I think I did an okay job, but Phuong did a better job of explaining her own story. So I encourage you to go back and take a listen. And then also, you know, just sharing a couple of clients stories. And something that I know that, I mean we kind of hit on it in the beginning of the episodes that is it okay to say Chinese people, but what are the correct terms? Again, like if we're going to stop using code words, we're just going to get very comfortable with, with naming things, naming cultures, naming, nationalities. So we say Asian American, like, is that okay? Is there other words we should know or should it be using when it comes to this community? Phuong: 29:03 Sure. So I typically use the term Asian American. But also when I talk about myself, sometimes I say Vietnamese American or Vietnamese and Chinese American. But more often now I also hear AAPI, meaning Asian American, Pacific Islander, AAPI. So I'm hearing that much more often now. I wouldn't be offended if someone said AAPI or Asian American. But I think AAPI is being used now because it included includes more communities. But back then I didn't, I, again, I didn't learn this until a few years ago. The term Asian American actually came out, organizing and forming solidarity between different Asian American groups, but back then, different Asian American communities, actually, not all of them, but some of them, and some within different groups didn't want that, that larger term to encompass everybody because they worried that the needs of specific groups Vietnamese Americans, Chinese Americans, Korean Americans would be masked and invisible when just looking at the larger group. And so it's, it's interesting. It's interesting just looking at the history of terms even. Rianka: 30:23 Yeah, absolutely. And I recall, you know, just I think one of my first standardized test or my first memory of circling in a bubble when it asks about race, for me personally, I am African American and I'm Chilean. And so when, when it asks, you know, what's your race? I think it was like black, not of Hispanic origin. And I'm just like, well, I'm both so do I put this, do I put other, like, what am I? And that's honestly what made me start asking my mom questions. It was just like, hey mom, you know, I got to start filling out these, these tests. She's like, what, what, what am I supposed to pick? So yeah, I think again, just standardized tests. The US Census Bureau, is becoming more inclusive of again, the mosaic that we are. Like, we're not all just one race. Some of us are biracial. Rianka: 31:23 Phuong, thank you again for coming back on. I encourage everyone to go back and listen to Phuong's first episode with 2050 trailblazers is again, that was in season one, episode six and Phuong before I let you go, is there anything else that you want to leave us with? Phuong: 31:44 When I talked to other Asian American people in my community, especially when they're saying thank you for, you know, speaking. Thank you for representing. What I do want to say too, coming back to the model minority myth that we talked about Rianka. So I think it's really important in addition to learning about Asian American history and current events with a critical lens, that, that we as an Asian American community understand the model minority myth. And that it is a myth, that really was created to divide, to divide us as Asian Americans and also to maintain and create anti black racism in the United States. We need to know that and we have to stop believing in that myth, right. As if it only helps us. Rianka: 32:35 Like always, I'm always learning something from you Phuong. So I just want to say thank you again for coming on to 2050 trailblazers and imparting us with your wisdom. Phuong: 32:45 Yes. So thank you so much for having me on your podcast, Rianka. Learning about Asian American history and current events with a critical lens. And sometimes we have to seek out that information because it's not always going to be put in front of us so easily that learning about our history will help us understand the history of race and racism in the United States and that ignoring Asian American history, when we look at the data or talk about it, erases a major part of our story as a country. And that's where I'll leave it at.